The Toughline Platform is a heavy duty and versatile body with a variety of options and accessories to handle a wide range of applications. Available in a variety of lengths and widths with a variety of floor options, the Toughline Platform makes an excellent grain body, stake rack body, contractor body, or just a great heavy duty flatbed. The understructure includes structural steel longsills and a gusset on every crossmember with an additional 90-degree break for added strength and stability. To save you time and expense, these beds ship painted gloss black and all LED clearance lights and wiring are preinstalled at the factory. 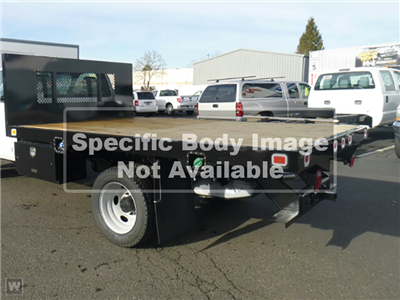 Numerous options and modifications are available to customize the platform body for your specific needs. Since 1946, Parkhurst has been designing and manufacturing the best truck equipment in the world. Parkhurst products offer dependability and quality at a fair price.